It was just over four years ago that you—the wondrous purple class of 2018—had your own versions of this moment. 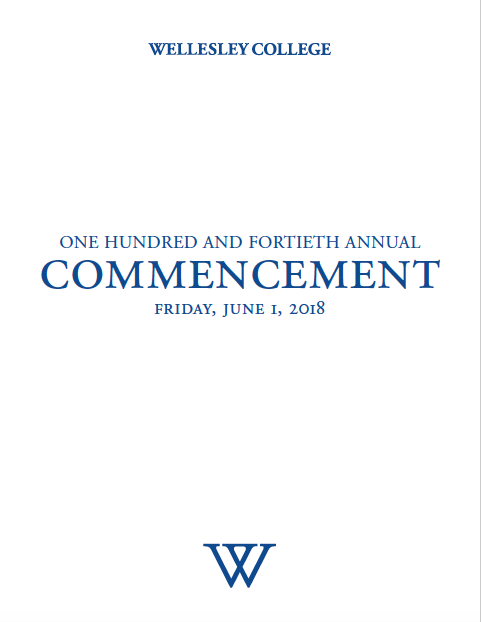 Today, you will no doubt be documenting another dream come true—your progression from Wellesley students to Wellesley alumnae. You take your place in what has been called the most powerful women’s network in the world—a siblinghood like no other. Now, you prepare to embark on a new chapter. New opportunities. New challenges. New people, new places, new ideas. And yes, new dreams. From childhood onward, we are asked about our dreams for the future. The degrees you receive today reflect a deep commitment to pursuing those dreams—to doing the hard work that will lead to a happy and meaningful life. How will you direct that energy in the months and years to come? Your answers to that question will go far to shape your lives. It’s common to pit dreams against practical considerations. Both sides have fierce proponents. But like so many dichotomies, this one strikes me as deeply false. What’s needed isn’t one or the other. I urge you to combine the two: to commit to a lifelong path of practical dreaming. This year marked the 50th anniversary of the assassination of the Reverend Dr. Martin Luther King Jr. This was 1968, a time of tremendous turmoil and division that at times feels not unlike our own. It’s not by chance that he used the word “dream.” He knew the power of language. And he knew the power of dreams to drive change across time and space. To be sure, the senseless violence continues. We saw another massacre just last month at a high school in Santa Fe, Texas. But despite such horrors, we also have growing reason for hope. Throughout, this past year, we’ve seen the unstoppable power of women’s and girl’s voices. Against a backdrop of unprecedented activism, against the backdrop of #MeToo, against the backdrop of a record number of women running for office, there is even renewed talk that the Equal Rights Amendment could yet be ratified. This dream, so long deferred, might yet come to pass. You have been part of this, and I could not be prouder. Practical dreams gain power when they are shared. Only then can they take root. Only then can they take flight. Practical dreams are also—and necessarily—deeply personal. They reflect your unique experiences, talents, and hungers. The world thrives on diversity. The world needs all your dreams. In February, five members of this graduating class received Pamela Daniels ’59 Fellowships to carry out dream projects during this past year. They ranged from the sciences to the arts—from an analysis of a traditional agricultural fertilizer known as bokashi to the creation of a solo performance piece about a girl’s efforts to become a saint in the Russian Orthodox Church. Together, they are a window into the vast and extraordinary range of gifts that this class brings to the world. The practical dreamer lives at the intersection of hope and reality. She takes to heart the words of our Latin motto, Non Ministrari sed Ministrare—not to be ministered unto, but to minister—even as she cares for and values herself as part of this tapestry. Nowhere is this more evident than in community service. This year, some of you were among the 65 Wellesley students who joined in “alternative spring breaks” designed to create positive change. Others volunteered at the Middlesex Correctional Center, working with women prisoners on everything from book clubs to strength training. These are just two examples of how you are already living your dreams into reality. But what if I don’t have a dream—practical or otherwise? Some of you may be hearing that whisper of doubt. You may even—understandably—be feeling a bit exasperated. Yes, I have interests, things that I care about. But a dream, an actual dream? I’m graduating, for goodness sake. Now I need one of those, too? Let me set your mind at ease. Wherever you are right now? It’s exactly the place to be. Dreams evolve over time. Quite often, perhaps more often than not, your dreams will find you. I’ve got a story that I think you’ll appreciate. It’s about a young woman who was once where you are today. Though this was some time ago—in 1912, to be precise. An English major, she’d enjoyed a successful college career. After graduation, however, she struggled to find her way. For a time, she worked in department stores. An ill-fated marriage followed. Her much older husband had a drinking problem. He did some time in prison. Not exactly an auspicious start. But this is what life after Wellesley looked like for Marjory Stoneman Douglas. That name is no doubt familiar. You know it from the Florida high school that bears her name, the site of the shooting that sparked today’s #NeverAgain movement. You are likely far less familiar with Marjory Stoneman Douglas herself. What accounted for this honor? Who did that confused young woman go on to become? Yet, little of it was planned. Douglas’ involvement with the Everglades did not even begin until she was well into her 50s and then only by chance. An established writer—she’d worked for her father’s Miami newspaper and went on to write short stories for magazines—she was asked to write a book on the Miami River. She felt that the terrain was too small. “What about the Everglades?” she countered. In telling this story, I don’t mean to encourage passivity. Of course, you must take action. That goes without saying. But it’s equally important to stay open—alert to unexpected calls. Never has this been truer than it is right now. Sometimes, it seems like every day brings a fresh assault on our most cherished values. Our distinguished alumna Madeleine Albright has warned that fascism poses a growing threat to democratic institutions—this is the subject of her new book. Women, people of color, undocumented people and immigrants, religious minorities, gender-nonconforming people—these are just a few of the groups that continue to be targeted in brutal and demeaning ways. There is a terrible irony in the fact that, as I urge you to commit to your dreams, some hundreds of thousands of young immigrant Dreamers face an uncertain future. Such injustices only affirm my charge to you today. If the world is broken, it’s up to us to repair it. Throughout history, women have played outsized roles in perilous times. As the rising generation of Wellesley women, you now stand ready to join them. No two of you will travel the same path. You will be teachers, lawyers, and physicians; writers, researchers, mothers. Some of you will join the growing legion of women running for elective office. Indeed, one of you could still become the United States’ first woman president—a role that is, sadly, still open. Many of you will do more than one of these things, at once or sequentially. Regardless of what your future holds, my hope for you is this: that whatever you do, wherever you go, you claim your voice and your power. That you see this both as your right and your responsibility. Dreaming is hard work. Yes, there will be moments of elation—moments like the one that Jada Wiltz, class of ’22 —captured on that viral video. But there will also be dark times—challenges and disappointments. At times you will feel afraid. Rest assured, this is normal—part of what it means to live your dreams. Those of you who attended our African Women’s Leadership Conference earlier this year got this message loud and clear from former Liberian President Ellen Johnson Sirleaf, the first elected female head of state in Africa. President Sirleaf even went so far as to suggest that your dreams should scare you. Be a nuisance when it counts. Do your part to inform and stimulate the public to join your action. Be depressed, discouraged, and disappointed at failure and the disheartening effects of ignorance, greed, corruption, and bad politics—but never give up. And really: Why should you? You leave this beautiful campus equipped with a liberal arts education that is second to none—the best possible preparation for these tumultuous times. You have forged friendships that will last a lifetime, one strand in a network of fierce support that spans generations and spans the world. You have honed tremendous talents in service to your values—in service to a future that you will go far to create. Much that lies ahead is unknown, but one thing is clear to me. Purple class of 2018: You are the practical dreamers that the world needs. I am so proud of who you are and who you will become.